In one of India’s crowded government hospitals, Thankappan*, a middle-aged man, lies in a vegetative state. His entire body seems frail, and his lips are discoloured. Thankappan’s wife and two daughters are watching over the family’s sole earner in the hospital. Anti-smoking campaigns have never penetrated into the poorest of the poor and rural areas of India. He was a construction worker on a building site when an unbearable pain in the chest struck him unconscious. Thankappan was rushed to hospital by his co-workers, and a quick diagnosis pointed out that he had myocardial infarction, or suffered what is otherwise known as a heart attack. Most of the serpentine blood vessels to his heart were clogged, severely damaging the muscle. Thankappan’s wife told me that her husband was a chain-smoker, and that for the past 25 years his favourite pastime was to smoke “bidi”, a hand-rolled cigarette with tobacco stuffed into tendu leaves and tied with a thread. This was the suspected reason for his heart attack. My husband used to smoke three bundles of bidi a day. He could survive without food but not without the regular dose of smoking … it was a habit right from his childhood and he couldn’t kick it. His bowel movement and his daily mood depended upon the smoking. If bidi was not available he used to get angry with everyone. He is the breadwinner for our family. Now the medical cost is unbearable, and I have to take [a] huge debt. Anti-smoking campaigns have never penetrated into the poorest of the poor and rural areas of India. Had Thankappan listened to the World Health Organization, with its “World No Tobacco Day” and focus in 2018 on “tobacco and heart disease”, he might have stopped smoking and remained a support for his family. It is estimated that more than 73 million people smoke bidis in India, of which 600,000 succumb to tobacco-related death every year, making bidis the number one killer among tobacco products. The cost attributed to tobacco-linked diseases in India is frequently cited in staggering figures – a Ministry of Health and Family Welfare study claimed the “total direct and indirect cost of diseases attributable to tobacco use” as more than US$15 billion in 2011, with the vast majority “indirect mortality costs”. But while at the same time the government gained in revenue 17% of the cost from the sale of tobacco products, the informal bidi market often escapes taxation. 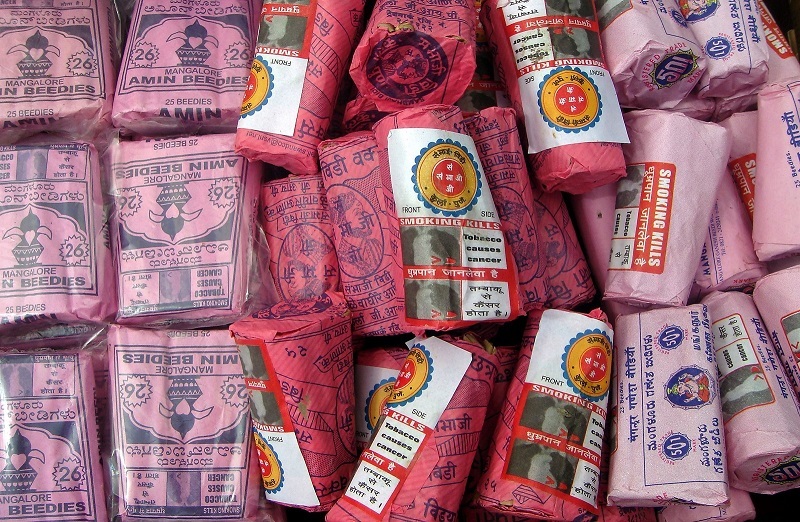 The WHO estimates that eight times as many bidis as cigarettes are sold in India. While higher taxes and stringent regulations are applied to cigarettes, there seems to be little progress in applying the same laws to bidis. This is in part because the government faces huge opposition whenever it raises taxes on bidis. Such opposition warns that millions of women are employed in the labour-intensive bidi industry, and that many will lose employment if sales decrease. To make matters worse, the higher taxes for cigarettes move smokers towards bidis, because they are under-taxed and cheaper. Pictorial warnings are not as graphic or overt as they are for cigarettes, leading some people to believe smoking bidis is actually the safer alternative. But according to health researchers, smoking bidis makes people even more prone to lung cancer than smoking cigarettes. Bidis contain more hazardous chemicals and nicotine than cigarettes, and require deeper and more frequent puffs to keep alight. Studies have already made clear that taxation is the most effective way to cut tobacco consumption, and there is no reason to believe this would be different for bidis. An economic analysis by anti-smoking campaigners in 2010 suggested that raising the taxes on bidis to 98 rupees per 1000 sticks would add roughly US$550 million to tax revenues, and prevent 15.5 million current and future smokers from dying prematurely. At present, the majority of bidi companies are unregulated, and higher taxation may not have the impact that was hoped. Most of the women involved in the bidi industry work from home, often assisted by their children, and, according to a research paper, are themselves prone to health problems, such as musculoskeletal, respiratory, eye, and skin problems. It is not the dearth of regulations so much as braving the opposition to change that is the challenge for the government. Yet a radical step is needed to confront this costly scourge in India.